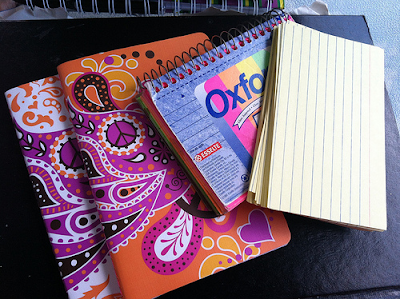 Ever since I was a child, I have been fascinated with and drawn towards notebooks and journals of all kinds. It was a treat to get to receive a blank notebook that was filled with empty pages, just waiting to be filled with possibilities! A trip to the drugstore might lead to the treat of getting a new notebook, visiting a great aunt who would regularly place a little treasure in her desk drawer for me (maybe a new box of crayons, a card game or a notebook! ), or the beginning of a new school year, when we got new school supplies, all of these occasions hold the memory of a new notebook. Blank notebooks are like new beginnings. 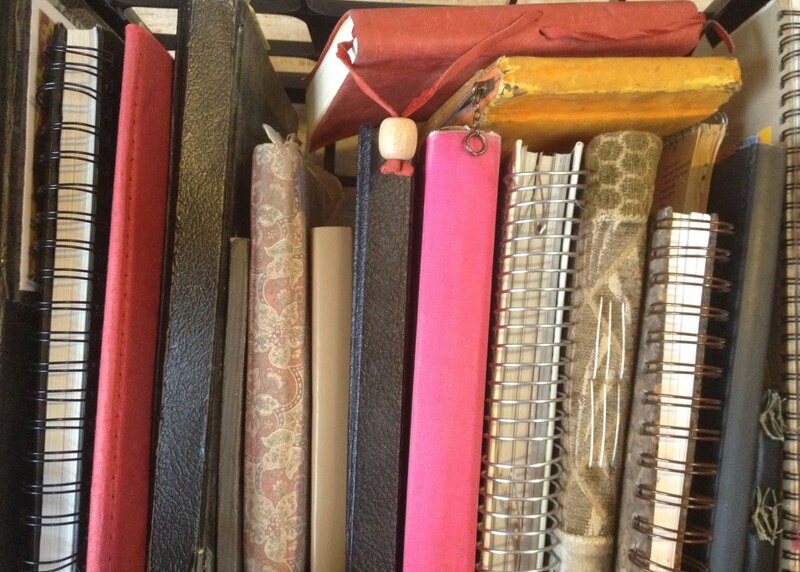 So, from these early memories of childhood, to my teen years of diary keeping, to my adult years of recording any and every type of memory, event, occasion, musings, ideas for projects and plans, lists of all kinds, and basically anything and everything, one could say that I am a notebook/journal enthusiast. Like many memory keepers, I do not limit my recollections and collections to only the written word, I also gather memorabilia that are tucked into the pages of a notebook. Whether it is a greeting card, note, well-love quote, photograph, magazine/newspaper clipping, ticket from an enjoyed event, or any interesting item, all have found their way into my books. Many of these loose pieces remain that way, simply nestled into a notebook, but many of them are also fastened to the page. 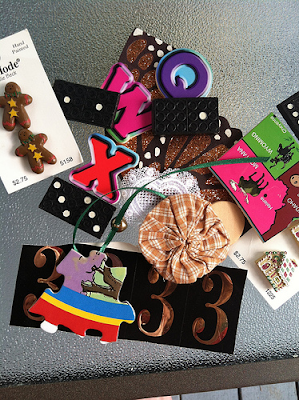 They are often hodge-podge together into a collage. After a while, these collages (both complete and incomplete, waiting for the next, just-right treasure to be glued or taped down), travel from being on the inside of my notebooks to becoming the covers of them. 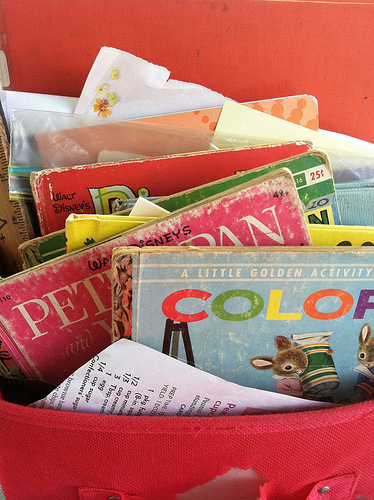 In addition to loving notebooks, I have also adored books for as long as I can remember. I became a collector of books, specifically children’s books. I cannot seem to bear to part with books and find myself gathering those that others discard. Most often, these discarded treasures become a part of the collection on my bookshelves, but sometimes, they have been so well-loved and read, that they are torn, tattered, and literally falling apart. These are the books that have found new life inside my journals and on the covers – becoming the collage-design artwork. I find that images can be another powerful way to gather, collect, and preserve inspirations, thoughts, interests and aspirations. If you haven’t already done so, I encourage you to make use of all of the little treasures that you keep in a shoebox somewhere and begin to assemble them on both the inside, and outside of your journals. You might wish to create your own collage journals by collecting interesting items/pictures (from magazines, etc) to create the covers of writing notebooks and/or create collages inside of journals (photos, pictures, drawings that may spark writing ideas). 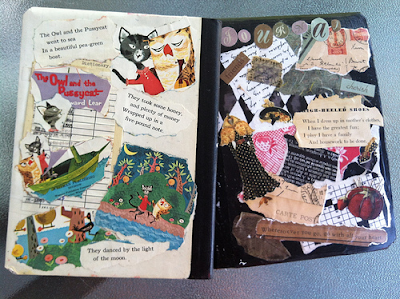 I personally think of my collages (especially the ones on the inside of my journals) as “treasure maps,” sort of along the lines of the “heart maps” that Georgia Heard discusses in her AWAKENING THE HEART – sort of a way for creative visualization. 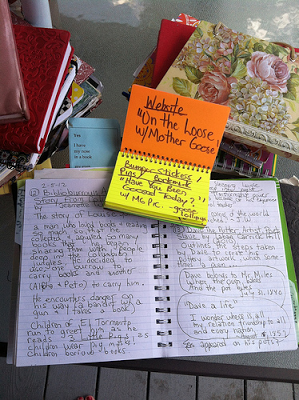 Make your musings, ideas, dreams, and doodlings, visible by using visual images in and on your notebooks. Have fun playing! Amy Zimmer Merrill is a Reading Specialist currently working with kindergarten through second grade. She has also recently obtained a degree in School Library and Information Technology and presents literacy-related workshops with a dear friend and colleague. Amy loves to read, write, and talk about children’s books. 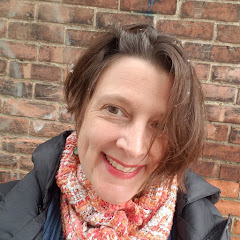 She reviews children’s books for LMC Magazine (Library Media Connection) and shares her thoughts, ideas, and love for children’s literature, reading, and literacy at Mrs. Merrill’s Book Breaks. 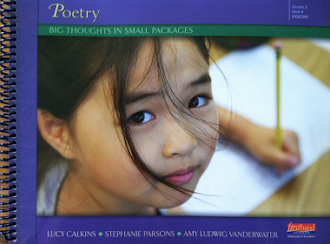 You can also read Amy's post about Poetry Breaks at The Poem Farm. Amy Zimmer Merrill will send a mini collage journal to a commenter on this post. Please leave your name and the best way to contact you along with your comment below and check back on Saturday, January 19 to see if you have won. Many thanks to Amy! 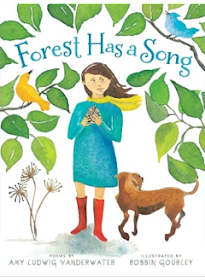 We are kindred spirits, Amy, in that little is as exciting as the promise of a new notebook or journal. Obsessed with office supplies is my official self-diagnosis. Thanks for sharing! I suspect that there are many of us out there that get excited when discovering a new paper supply store. 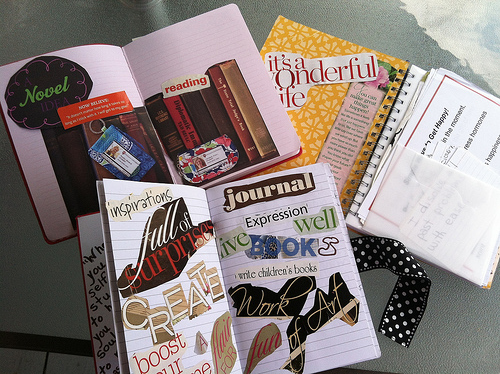 I love hearing about someone who cuts and pastes and writes all in the journals, making some beautiful 'life maps'. Thanks to both of you, Amy & Amy! Please don't enter me in the drawing; I have many journals waiting, so good to pass your prize on to others. Ah, yes, I love journals and used to collect them in grade school, high school, and college. But somewhere along the way I stopped buying them, and now my poem and story notes are in a pile of ripped-off pages from a boring old notepad. Amy's journals are an inspiration...perhaps I will add journals to my gift lists from now on. Thank you both for sharing! 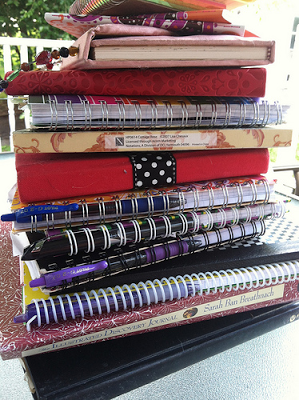 Love your journals, Amy! I am impressed. They are probably works of art!! Creative but filled with what matters to you. Thanks so much for sharing. Journals are important for the snapshots of your life!!!!!!! Love this idea...teaching creative writing at an alternative high school...can't wait to use this!